To enhance and define the facial contour and jawline. CHIN AUGMENTATION: Incisions are made in a crease under the chin and a pocket is created to help the implant rest on the bone. The implant is inserted and secured with sutures. Create more definition and projection for a weak chin, improve the overall facial profile, draw attention to the eyes for a more elegant appearance, and increase the strength of facial features. A sensory nerve in the chin may be affected, resulting in temporary, or very rarely, permanent numbness of the lip. Implant malplacement or displacement, which may rarely require revision surgery. The degree of augmentation required, depending on the patient's desire for drama or subtlety. Dental malocclusion or other jaw conditions, which could be better treated through oral surgery and/or orthodontics rather than chin augmentation. The shape and size of chin implants. 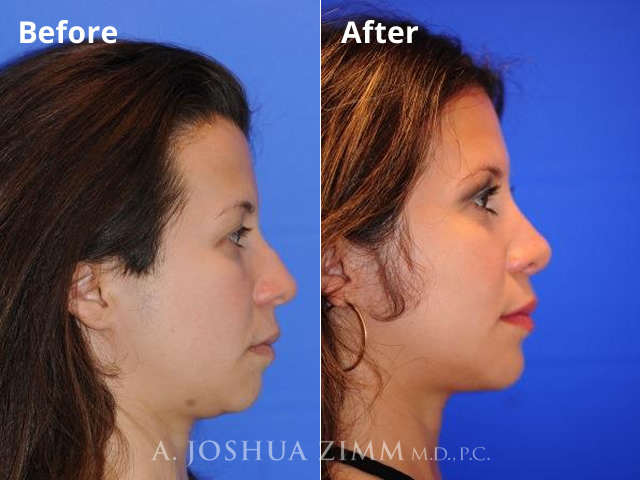 If rhinoplasty should be considered in conjunction with chin augmentation for better results. CHIN AUGMENTATION: Takes approximately 1 hour, or 30 minutes when performed in conjunction with other procedures such as rhinoplasty. After same-day discharge, swelling and discoloration are resolved by 1 week to 10 days. Normal activities can be resumed soon after and full contact sports can be re-introduced after 6 weeks.